​A high quality, accurate pin nailer brings a world of convenience to your woodworking projects. You'll be able to quickly fasten pieces together, holding them in place until your glue dries. This makes it so that you can move quicker, but also have more precision in the finished product. The best pin nailer combines power and accuracy, ​whereas a cheap subsitute fires the pin nails everywhere. We've used the worst nailers on the market before, and its not fun - it can ruin a project. That's why we've put together a review of the top pin nail guns on the market. Here’s a look at three very capable pin nail ​options that we found to be some of the best nailers for trim and other woodworking projects​. Each has their own benefits and drawbacks, but each can perform your fastening jobs with ease and grace. Weighing in at 2.2 pounds, the ​Porter-Cable PIN138 Nail Gun is a handy pin nailer that offers plenty of durability and function. This ​nail​er uses 23-gauge headless and slight head pin nails that range from 5/8 to 1-3/8 inches in length. It also comes with 2,000 pin nails to get you started. When using this ​nailer, you’ll appreciate the automatic adjustment feature that allows you to switch pin nail size with the need for a tool. There is also a low-nail indicator and dry-fire lock-out safety system for added safety. It has a rear exhaust system to prevent moisture from penetrating your wood surface and can be clipped to a tool belt with the reversible clip. Other features of the Porter Cable ​nail​er include a maintenance-free, oil-free motor and the ability to sink 1-3/8-inch pin nails into hardwoods. It also comes with a carrying case for added convenience. The only drawback that we can see with this pin nailer is the short length of the pin nails. You may have some issues installing crown molding with it because of the pin length provided, yet this nailer has plenty of power and can penetrate MDF with ease. It also comes with a three-year limited warranty. The ​Makita AF353​ is dedicated to driving headless pins that have a length that is 5/8 to 1-3/8 inches. It is sized for 23-gauge nail pins and features a compact 2-pound weight. It uses two-finger operation for controlled use of the device. Safety options on this pin nail​ gun model include a nail lockout and indicator window to alert when reloading is necessary. It is designed with a reversible belt-hook for easy carrying and a rear exhaust port to keep your wood project moisture-free. A built-in air duster cleans your work surface as you drive the pin nails into it. 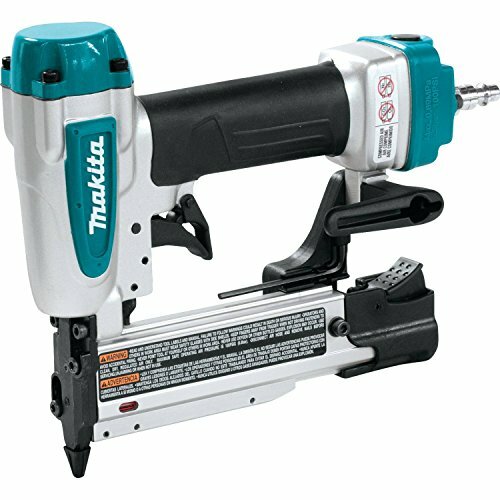 Additional features of this Makita pin nailer include two removable no-mar tips and a carrying case. It also is constructed of aluminum for strength and durability. It also comes with a three-year warranty for added coverage. We only noticed one drawback with this very capable ​nail gun. It does not allow you to use slight head pins, which provides some limitations. But, if your application requires headless pins, you’ll find this ​model can meet your expectations. Developed for use with both headless and slight head pins, the ​ReconPIN138R​ can utilize 23-gauge pin dimensions in 5/8 to 1-3/8 inch lengths. It features a maintenance-free, oil-free motor and has plenty of power to drive pins into oak. A rear exhaust system eliminates moisture, and a dry-fire lock-out offers additional safety. This ​nail​er is designed with a narrow nose that allows you to get into tight corners without fighting the angle. Pins are loaded at the side, and the micro pin capacity is 130 units. A reversible belt clip holds the ​nailer in place, and a dual trigger allows for managed control of the tool. A reload indicator light lets you know when you need to add more pins. The main drawback of this ​model is the short one-year warranty it comes with. But, it is designed to be a rugged ​nail gun so the need to use the warranty may not be there. A carrying case completes the package. 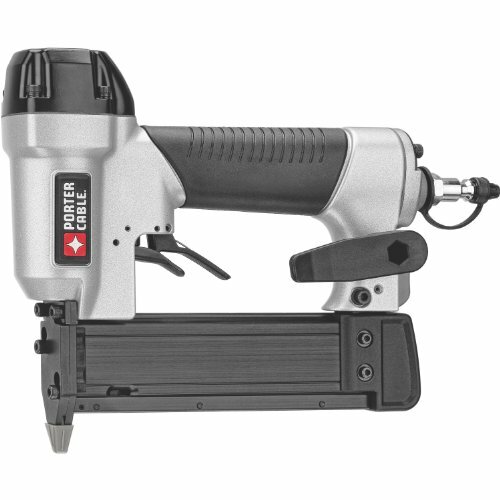 When choosing the ​top pin nail gun for your workshop, we recommend the ​​Porter-Cable PIN138 Inch Pin Nailer. This ​nail​er comes with plenty of features at a moderate price tag. While you’d do well with any of these pin nail models, the Porter Cable model is our top pick because it offers a variety of applications as well as durability. It is the perfect pick to add to your toolbox. ​Not to be confused with a brad nailer, a pin nail gun shoots headless nails (nails without heads) into wood. ​While these small nails may not offer the best hold by themselves, they offer a virtually unnoticeable hole (after sanding) which is a huge plus when you want an extra layer of hold with your wood projects without having nail heads visible. ​Utilizing small nails that resemble pins, a pin nailer is more of a specialized tool that is great if you do a lot of projects that require clamping to help the wood glue dry. Due to the smallness of the nail, these nails are not ideal for being the main holding force when you are woodworking. Instead, these are the perfect companion for wood projects that mainly rely on wood glue to create a strong hold. The pin nails work as an inner clamp to hold the glue while it dries. Since the nails are so small and don’t leave a large head on the top, then these are the perfect choice for a clamp that stays in side of your projects to help dry the glue and continue to support the project long after. ​The only con is that without the helping adhesive power of wood glue, then the pin nail will not give you a good hold. ​When you decide to invest in a good pin nailer, then you want to have multiple reasons to use it. Thanks to it’s small nail, ​its a great choice for thin to medium thick wood projects. It can be used on thinner more delicate wood projects like moldings, framework and other small projects like bookends. A good majority of ​pin nail gun owners use this great tool for installing trim and molding. This is mainly due to the almost invisible hole that remains after you shoot a nail into the trim to help stabilize it. This is also a great clamping tool to keep on hand when you are glueing pieces of wood together and you just want something quick to keep the wood still while it is drying. Just apply the glue, press the wood pieces together and pop a pin nail in to keep the pieces together while it dries. There is no one use for the pin nailer and you are only as limited with it as you choose to be. ​There are some factors you need to keep in mind. You need to think about how you will use ​this ​your pin nailer and what type of applications it should be best suited towards. This will allow you to select a model that is tailored to your needs and provide you with a tool that you’ll use frequently. ​One of the most important features is the size of pin it can drive. This will determine the type of projects you are able to complete. Longer pin nails will be able to penetrate hardwoods like oak while a short pin can be used for trim work or softer woods like pine. We prefer the option of being able to go deeper with our pin nails. In general, having that flexibility is better. Most pin nailers cap out at around 1", meaning that you are restricted to using pin nails that have a length (or depth) of 1 inch. Some of the models in our review go deeper, and we even have one brand that goes as deep as 2". ​If you think you'll be needing to consistently use nails that are longer than 1", you could also consider picking up a good brad nailer. Brad nails are thicker, and have some drawbacks, but most models that we reviewed have nail lengths that exceed 2". While being able to drive a deeper nail, you need to make sure that you keep your hands clear of the pin nail’s driving area just in case the nail is driven too far in. This can happen, especially with a ​pin gun that can go 2” deep. You also need to factor in how thick/thin the wood is and the level of PSI that is selected. ​​Pneumatic pin nailers are attached to an air compressor, and this is where they draw their power to fire the pin nail into the material. And, PSI (pounds per square inch) is the measure of how powerful the air is fired. In other words, the higher the PSI, the more powerful the nail gun. ​Most brands provide a PSI range for their nailers, which allows you to adjust how much power you use. This range is key, as you'll want to adjust it depending on the material you are using the pins in. Thicker materials require a higher PSI to push the nail into, whereas thinner, softer materials use a lower PSI> Consider what you'll be using your pain nailer for. In general, the wider the PSI range of your nailer, the more versatile it is. ​The beauty of this type of nail​er is that you can work fast. The downside of that is that you'll go through pin nails quickly. So you're not having to reload ​it every minute, pay attention of the capacity of nails that it can hold. We find that a minimum of 100 nails is a good starting point, but the more the better. All of the nailers on our review can hold at least 130 at at time. ​There are some built in features that make ​nail guns safer to work with. These safety features work to keep you safer while working with the high firing tools. ​If you have a choice, it is best to pick ​one that offers a full sequence trigger. This means that in a nutshell, just squeezing the trigger won’t allow the nail gun to fire freely. In order to drive a nail​, you have to meet certain pressure points to unlock the full trigger. The safety tip of the gun needs to be pushed into a surface that you will be driving a nail into, and then you can squeeze the full trigger to release a nail. While this is a slower responding nail gun that won’t be as quick to fire off multiple nails per minute, the trade off is that you really can’t misfire ​it into the air potentially harming yourself or others. ​When you run out of nails, pulling the trigger on an empty nail gun can result in strike marks that can damage your small wood projects. Dry firing your pin nailer can also potentially damage the tool by allowing the hammer inside to strike against the opening and other firing pieces inside of the machine. By having a dry-fire lockout system, you are preventing any damage that can happen to your projects and prolonging the life of ​your model. ​These lights are very important to consider when you are looking for ​a top pin nail gun. This is because indicators lights are the tools specific way of communicating with you about important things. ​On/Off light - This light will alert you that the machine is pulled in and powered on. When you see this light it is important to know that ​it is on and ready to be used, so you need to practice OSHA safety when handling this nail gun. ​Low on pins - This light lets you know that you are running low on nails or pins inside of the machine. It is important to turn ​it off to reload so that you don’t accidentally dry fire the machine and risk damage to your nail gun or the project that you are working on. ​Battery - If you own a cordless model, then you may have a battery indicator light to inform you that your battery is getting low. This light will also blink or stay solid as it is charging so that you know the status. When it comes to ​safety, you really want to make sure that you are following safe practices while you are around nail guns. Always take a moment to pause before you use ​the gun to make sure that you are aware of it and that you are not distracted while operating it. These built in safety features were created to help keep you safe, but if you aren’t careful when using ​it, then you can be at risk for harm. ​You also want ​a model that is lightweight. This feature is a no-brainer because this is a handheld tool, you’ll spend a good majority of your time holding the device, and a lightweight model will help eliminate exhaustion as you work. The weight of ​your specific ​nailer model can vary between lightweight models that are 2 pounds, to a little heavier models that can weigh almost 5 pounds. While this isn’t a large stretch between the weight, you need to keep in mind how much you will be using ​it for work or during your hobby time. A higher weighted ​option can exhaust your hand and forearm quicker than a lightweight one. In order to keep the weight down while creating a quality tool, many models are constructed of lightweight aluminum with a rubberized grip for added durability and ergonomics. ​As with most tools, you have the option of deciding between one that has a cord and one that is cordless with a rechargeable battery. ​Long jobs - when you need to work for longer periods of time, it’s easier to have a constant supply of power so you aren’t interrupted while you are in the flow of working. ​Reliability - you don’t have to worry about packing, finding or forgetting to recharge a battery. You also don’t have to deal with ​one that just stops working halfway through a job, as long as you have a plug-in then you have power. ​Freedom - take your pin nail gun anywhere, as you're not tethered to a wall. This is a great option if you have a lot of smaller projects that require you to move around, or if you don't need to use the nail gun for long periods of time. 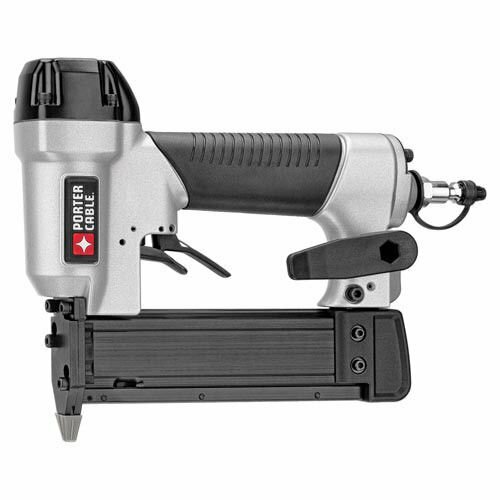 ​Carry power with you - you can use a cordless pin nailer in places that don’t have power connected. So whether you need to use it during a blackout, or take it to help build in places that don’t currently have power. When it comes to deciding on a corded versus cordless option, it really depends on what and how often you will be using your new ​nailer. Weighing the pros and cons of each model will help you find the ​right option that has a good quality rating and offers the right features for your tool needs. ​Finding ​an option that meets all the requirements you need and also offers a warranty is ​a plus. Not to say that these things break a lot, but due to the mechanics of how they are built, it’s nice to have a warranty to back them up. A warranty of at least three years is recommended to ensure you have the support you need should you have any issues with your pin nailer down the road. Keep in mind that purchasing a used or refurbished ​nail gun won’t come with a standard manufacturer warranty. Looking for options such as an oil-free motor, carrying case, and narrow nose can also provide you with a multifunctional ​model that will excel in a range of fastening applications..
​An oil free motor is exactly what it sounds like. You won’t need to deal with adding or messy oil cleanups when you opt for this type of pin ​nail gun. An oil-free motor will also eliminate the need to perform any maintenance on the nail pin throughout your ownership. ​Most ​of these types of nail guns will come with some type of carrying case to help you keep it protected while you are travelling or to give you an organized storage solution. For higher priced models you can get a hardshell case that not only keeps your parts together but it also protects it against being damaged if you take it to work daily. ​A narrow nose will allow you to get into tight areas with ease. This is a great feature for a pin nail gun if you are doing a lot of smaller projects or working in tight spaces. The narrow nose won’t hinder you in day to day projects. For many, a brand new pin nailer is exactly what is needed to breeze through a variety of home DIY projects. If you're in the market for a high quality nail gun, make sure that it is a pin nailer you need. Once decided, ​evaluate your options and the variations that each type offer before you make your decision.